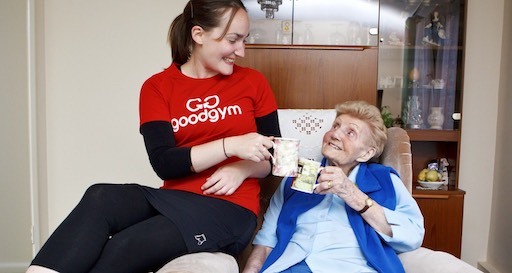 Cerelia, 81, was referred to GoodGym by Age UK Islington. Although Cerelia has family who visit her, she often feels lonely. She didn’t quite know what to expect having a GoodGym runner but believes you always have to try something before you know if you’ll like it; Patrick now runs to visit her every Wednesday evening for a chat. Cerelia was born in Grenada and moved to the UK in her twenties to be with her husband, who came to London to work as a bus driver. She enjoyed her job as a civil servant for the Department of Employment, working in the same office for more than 20 years. Once retired she began to feel lonely and decided to become a foster mum, fostering 16 children from North London. She considers her own six children her biggest achievement in life. She also has many grandchildren and proudly displays their photos throughout her flat. She has always enjoyed travelling, flying to places like Florida, Bermuda, Atlanta, Barbados and New York. Grenada is still top of her list though: “Imagine what heaven is like and that’s it. If I die, just send me to Grenada”. It gives me something to look forward to every Wednesday; I’m usually sitting here by myself. Patrick and I have plenty to talk about, sometimes we just chat rubbish. He’s so easy to get along with. GoodGym’s a great thing! I had lost interest in running after my marathon in 2012; running to beat the clock was no longer for me. I thought getting involved in GoodGym's coach runs would be a brilliant way for me to get fit, reduce loneliness for an isolated older person and learn new perspectives: a ‘win-win-win situation’. In only my second visit I remember standing up to leave after around 40 minutes but Cerelia said "stay a while longer; I'm enjoying talking to you". I couldn't ask for a better outcome so early on in our friendship. I have learned about life in Grenada, how London has changed since Cerelia moved here, her family and the importance of religion in her life. I used to be in a gospel choir and performed in Barbados so we have talked about singing and life in tropical paradises. It is still early days with Cerelia and we have only touched the tip of the iceberg; there is still plenty for us to share and learn about each other and I look forward to seeing our friendship continue to develop. It is a wonderful thing to do and it is remarkable how much impact you can make in such a short time while also getting fit. Sure beats running on a treadmill.